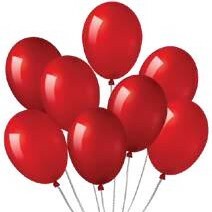 Balloons Solid Col. 25Pk 6Asst. 11cm Long l Inflate to 23cm. White | Blue | Yellow | Red | Green | Pink. Latex| 2g. 42g Packaging: Printed Polybag.